The Sinclair Group is firmly established as the largest and most successful automotive group in Wales. They represent some of the world’s most prestigious brands including Mercedes-Benz, Audi, Volkswagen, SEAT and ŠKODA. To mark the release of the all-new Volkswagen Polo Beats, the Sinclair Group commissioned us to design a creative theme and an advertising strategy for their Volkswagen dealership. The creative theme would be used for a multi-channel campaign. The brief was simple. They wanted us to create a concept that would bring attention to the unusual and exciting Dre Beats feature without detracting from the Volkswagen brand. Our creative direction led us to design a theme based on the clever wordplay of ‘Beauty and the beats’. This theme would be repeated throughout each communication touch point. Besides being used for email campaigns and website homepage, the creative artwork was used across a number of social media channels including Twitter and Facebook. 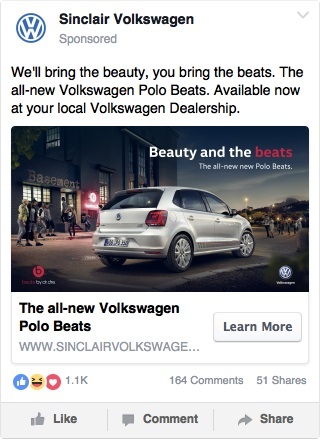 Once we had the creative theme down, we started to map out a distribution strategy for a Facebook advertising campaign by aligning the customer profile from Volkswagen HQ with our finely tuned demographic, interest and behavioural targeting.